The Via Mare restaurant in Greenbelt 3 is a fusion of both the Cafe and the Oyster Bar. For this afternoon, we opted to order from the Cafe's menu only. 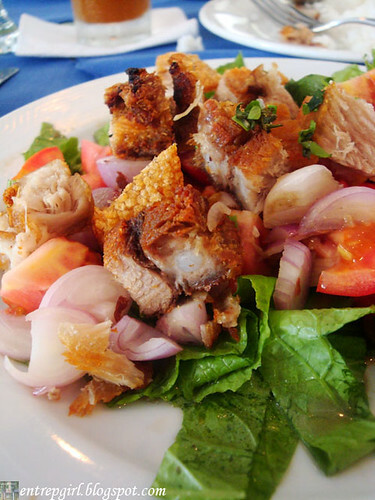 We had the Ensaladang Bagnet (P160), crispy roasted pork with tomatoes and shallots in calamansi and bagoong dressing. The salad-like presentation is appealing to the eyes. This actually goes quite nicely with rice (better order lots of it because this dish is really appetizing). I love the whole mixture of pork and tomatoes drenched in a sour and salty sauce. It bursts with so much flavor, it makes you crave for more. For the post-meal fare, we had the Puto Bumbong (P62) with grated Queso De Bola (+P22). You can also opt for the grated cheddar cheese (+P15). This native delicacy really depends on the sidings for flavor and the queso de bola together with the brown sugar and coconut did not disappoint. The consistency of the glutinous rice is just right, not too dense and not too sticky. 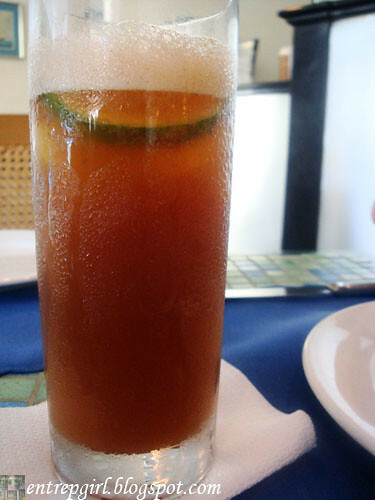 Of course, we ended the meal with the usual Iced Tea (P80) beverage, which was a little too lemony and a bit diluted. I've always enjoyed eating at Via Mare, but I've never tried their puto bumbong and ensaladang bagnet. I'd usually order the Bibingka and the pancit palabok. Yum! Via Mare is a great restaurant! Yeah! I heard it that Via Mare is one of the best restaurant in the Metro and one of the longest in the business. 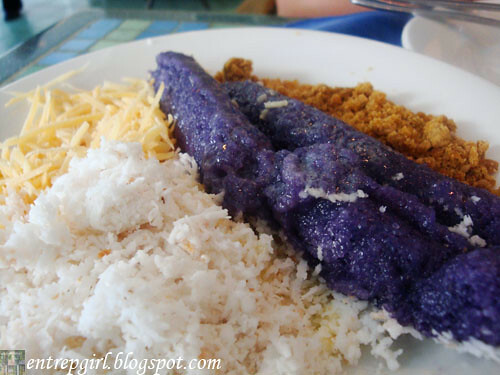 Oh my, Oh my... now i miss puto bumbong. I like Via Mare too.